Today’s changing marketplace increasingly gives consumers control over their brand relationships, including the terms of engagement. Emboldened and empowered by technology, consumers voice their preferences to you, the marketer. They tell you – implicitly and explicitly -- where, when, what, and how often they are willing to engage with your brand. Perceptive marketers are listening to and capitalizing on what their customers and prospects are saying as well as to what they’re not saying, but doing. 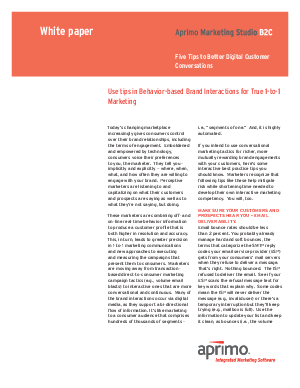 This white paper presents interactive best practice tips to guide you when using conversational marketing tactics for richer, more mutually rewarding brand engagements with your customers. These tips will help mitigate risk while shortening time needed to develop your own interactive marketing competency.